Pictured are some of the military uniforms currently on display at the Myers Inn Museum in Sunbury. “Stories Behind the Exhibit” will be the topic for the Big Walnut Area Historical Society meeting at 7:30 p.m. Tuesday, June 12, in the Myers Inn Museum, 45 S. Columbus St., Sunbury. The program, which includes a tour of the exhibit is open and free to the public. 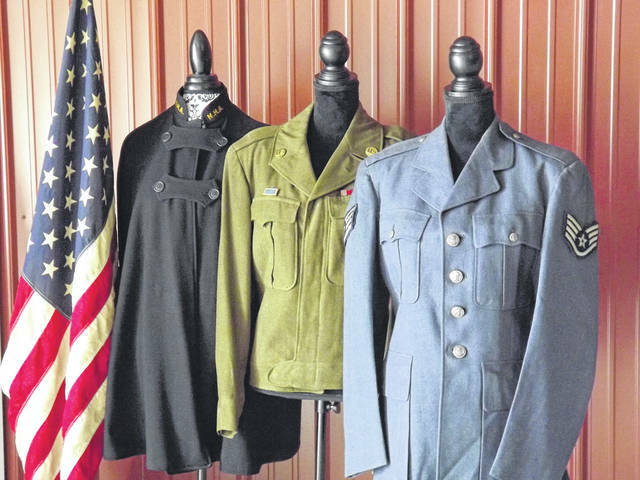 The exhibit of military uniforms and artifacts of local veterans, which opened May 25 at the Myers Inn Museum, is in honor of longtime Big Walnut Area’s Historical Society Board of Trustees member, the late Bob Cheadle. The exhibit was put together by Sue and Bill Comisford. Cheadle was a veteran of the United States Army and served at the end of WWII and during the Korean War. During his time in the Army, Cheadle became a master parachutist, jumping over 50 times. As a trustee of the BWAHS, he especially enjoyed going to area cemeteries with the historical society, Sunbury Halter and Saddle 4-H Club, and the American Legion when then honored veterans by placing holders and American flags on the graves of our local veterans. Cheadle wore his uniform, introduced the spirits of his fellow comrades to the group, and saluted the ghosts as they marched away. In addition to the exhibit, there will be a continuous showing of the life of Civil War Gen. William S. Rosecrans. Civil War memorabilia from Rick Helwig is on display as well as Polly Horn’s collection of Rosecrans’ memorabilia. The exhibit is open from noon to 3 p.m. Thursdays, Friday and Sunday; and from 10 a.m. to 5 p.m. on Saturday. The museum will be open from 9 a.m. to 3 p.m. on Wednesday, July 4. For more information on the museum or the program, visit http://BigWalnutHistory.org. Submitted by the Big Walnut Area Historical Society.